«DEPS Ukraine» received the confirmation from State certification body of Declaration of conformity for Arc Fusion Splicer IFS-10. «DEPS Ukraine» as the exclusive representative of INNO Instrument ,Ltd (Korea), obtained the approval of the Declaration of conformity for fiber optic splicing machines type IFS-10. "UkrTEST" (Kiev) ,the State certification body , have been tested protocols and confirmed the compliance of IFS-10 splicers with the requirements of Ukrainian and international standards for low voltage equipment safety and electromagnetic compatibility. 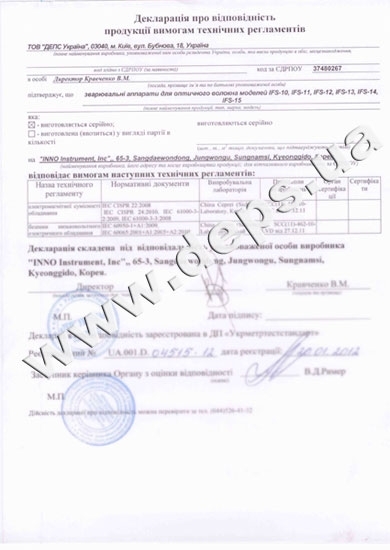 For the first time in Ukraine the Declaration of the leading manufacturer of fiber optic splicing equipment INNO Instrument, Ltd was registered in conformity with Technical Regulations of Ukraine (Cabinet Resolution № 1149 dated 29.10.2009 and № 1149 dated 29.08.2009.) and with the EU Directives (2006/95/EC and 2004/108/EC). Declaration of conformity agreed by the State certification body in its effect is equivalent to the Certificate of conformity according to the Law of Ukraine "On Conformity Assessment" (dated 17.05.2001) which allows to import, to sell and to operate the given equipment. INNO Instrument M7 вже у продажу!